To start, think of a consumer on your ecommerce site. They scroll through the carefully selected featured content on your site. For some reason, something on the screen catches their eye, and they click through to one of your product pages. Their eyes rest on the framed image of your product and travel through the concise product description. … and then they leave. Just like that, one of your customers has fallen out of the funnel, abandoning their cart as well as their possible transaction with your company. Speaking as an editor at MECLABS Institute (MarketingExperiments’ parent company) and as a consumer for over 20 years, I feel comfortable saying that we customers are a fickle crowd. In the few minutes and steps it takes from adding a product to the cart to actually checking out, a million different things can happen to prevent purchase. Marketers need to be ready to battle everything — from customer frustration with the purchase process to simple distraction. Thankfully, an abandoned cart does not have to mean a lost transaction. A cart abandonment email campaign can be an excellent, though underutilized, way to reconnect with your lost customer and potentially make a purchase. According to MarketingSherpa’s 2012 Email Marketing Benchmark Report, when asked what types of automated emails their organization deploys, surveyed marketers ranked “Shopping cart abandonment” as dead last at 11%. However, 51% of surveyed American adults found these emails to be helpful. Here are three tips to help you save your next ecommerce sale. This first step is a little counterintuitive for this blog post, but it’s essential. In an ideal world, you would never need to utilize a cart abandonment campaign because your customer would never abandon their cart. My colleague, Lauren Pitchford, Senior Research Manager, MECLABS Institute, wrote a great guide about creating the best checkout experience possible, which really explores these aforementioned ideas in-depth. Like I mentioned before, this isn’t an ideal world, and customers are going to leave cart items. This is where a cart abandonment email campaign can really be beneficial. But it’s important to remember that these campaigns aren’t an ecommerce panacea. 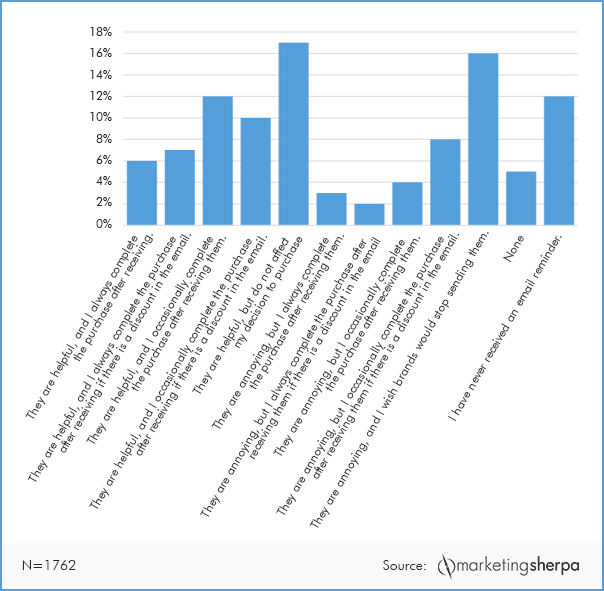 A recent Chart of the Week from MarketingSherpa (sister company to MarketingExperiments) explored what customers thought of cart abandonment remarketing. Q. What are your views of reminder emails that tell you when you have an item in your online shopping cart that has not yet been purchased? Though 51% of customers found cart abandonment email campaigns to be helpful, more than a third of the surveyed group (38%) found them to be annoying. Really, it boils down to who your target demographic is. Though this survey produced interesting results, don’t take these numbers as gospel. You know your customers better than any graph, so it’s up to you to decide if a cart abandonment campaign is something your customers will respond to. At the very least, it’s a wonderful way reach out to your customer. So you’ve optimized your checkout process the most you possibly can, looked into your customers’ email habits and have decided to start a cart abandonment campaign. Before you dive into your copy and formatting options, take a step back and determine what the purpose of that follow-up email should really be. A cart abandonment email is a wonderful opportunity for marketers. You have this customer who you know is interested in your company and products. They know your name, they know what you sell, and they like you enough to choose you over your competitors. Your company has already stood out to them. Here’s where most cart abandonment emails fall flat. Instead of using this contact opportunity to further communicate your company’s value proposition, most companies use a cart abandonment follow-up to make a hard sell for the items left behind. Notice how generic the subject line is: “Thank you for visiting OtterBox.” The largest line in the email’s body is even worse. This email could have come from the abandoned checkout of any company out there, which is a shame because OtterBox is a very distinct and well-known brand. The copy could have played with the idea that it’s “protecting” you from losing a great phone case or that OtterBox is willing to go the extra mile — anything to nod to the company’s very clear value proposition of being one of the most durable phone cases on the mainstream market. Instead, the send opts for a generic approach, an advertised promotion for free standard shipping and a robotic-feeling compliment (“You have great taste, as this is a popular item”). ModCloth is an ecommerce clothing line that offers “Unique & Cute Clothing.” Just from the gnome-centric subject line and the “Pop Quiz” introductory phrase, ModCloth’s quirky yet upbeat sense of style is communicated. Even the bright colors and artsy graphics support this tone and, as a result, the value proposition. Also, referring to the customer as a “ModLover” creates a positive sense of community between the customer and the brand, which is a major aspect of ModCloth’s value proposition — letting their customers express their unique sense of style and feel happy and comfortable while doing it. Cart abandonment campaigns can be an excellent way to save a lost sale or further communicate with customers. A trigger campaign, which included cart abandonment, resulted in a 20% to 40% revenue contribution every week for BCBGMaxAzria. A first-time cart abandonment campaign for Customer Service Hardware increased the conversion rate 1,858% compared to weekly sends and recouped $97,000 in revenue after only five months. As with any marketing effort, the only way to know for sure if something works is to test. The main takeaway from this post is to always be thinking through your customer’s journey. Every piece of content, no matter how small, communicates something to the customer about your brand. Make sure you’re presenting your value proposition clearly to compel customers to convert. Undeniably it is an informative article on remarketing campaign, but I think we can try dynamic remarketing with custom parameters. @Kayla Cobb, I would like to know your experience with remarketing VS dynamic remarketing for an eCommerce store with the goal to increase sales/orders. Unfortunately, I don’t have any experience in any sort of remarketing for an ecommerce store. I’m the copy editor for MarketingExperiments, so my job is to essentially take all of the tests we perform under the MECLABS and MarketingExperiments brands and the case studies we showcase through MarketingSherpa and help present them to our audience. Though I don’t have any direct experience, I do have access to several helpful resources. I’d recommend downloading the MarketingSherpa Ecommerce Benchmark Study for researched insights into ecommerce trends. I’d also recommend our resources on ecommerce optimization and site optimization. I hope this helps. Good luck with your ecommerce efforts! This article is really helpful for online shops. If you want to have a successful online business then you need to have an effective digital marketing campaign. I suspect that a great way to do this would be to put funny cat pictures on all the pages throughout the checkout process until way after the sale is completed. And to include a final, most memorable cat funny cat picture on their email receipt. I agree! A stream of cat pictures would definitely keep me hooked during my checkout. Awesome! Really good information about how to construct a customer-focused remarketing campaign! Thank you very muck Kayla for sharing valuable information, especially case study. I have downloaded. What about after some days have passed? Would you keep sending reminders? If so, how often? Though sending cart abandonment emails is clearly important, I would be wary about sending too many or making the sends too frequent. From a consumer point of view, too many sends can come across as annoying or desperate. The most emails I would send would probably be three: one on the day the cart was abandoned, the second later in the same week and the third a week after the first email. This case study, “Email Marketing: First-time cart abandonment campaign drives a conversion rate 1,858% higher than weekly send” presents a good strategy for cart abandonment sends with a coupon. Fantastic. And perhaps it’s best to focus on getting them to stay on the mailing list.